In Oakland this past March, U.S. District Judge D. Lowell Jensen sentenced Michael Norton, 53, owner of the now defunct Kona Kai Coffee, to 30 months in prison as a result of his pleading guilty to wire fraud and tax evasion. 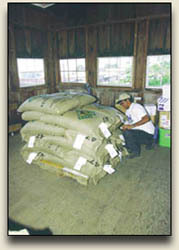 Norton purchased 3.6 million pounds of cheaper, lower grade Central American coffee from 1993 to 1996; rebagged it as "Pure Kona Coffee"; and netted nearly $15 million dollars from his illegal scheme. Besides jail time Norton was ordered to pay $475,000 in restitution and $440,000 in delinquent taxes for diverting $1.3 million to a Swiss bank account. The damages Norton inflicted on the local Kona coffee industry were catastrophic. 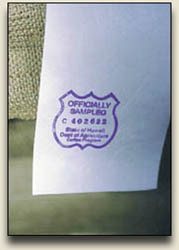 Hard working and honest farmers, producers and sellers of 100% Kona coffee were cheated out of legitimate sales during these years and the reputation of 100% Kona coffee was greatly tarnished. While Norton was surrounded by family and friends outside of the courthouse he laughed and said, "I can't see how it would be possible to make a comment that would be in my interest." Billy Palea of the State of Hawaii Dept. 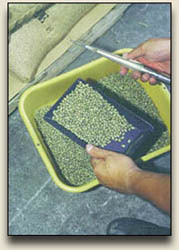 of Agriculture pulls a random sample from a lot of green coffee beans at Captain Cook Coffee Company. This coffee will be tested in the department's lab for size, color, moisture content and cupped for aroma and flavor before being certified. His lawyer, Penny Cooper of Emeryville, California said no one was victimized by the scheme and at worst coffee aficionados just got a different cup of joe. It is now mandatory that all green coffee leaving Hawaii must be State of Hawaii Dept. of Agriculture certified. This certification program tests for size, color, moisture content and includes a cupping test for aroma and flavor. This "Officialy Sampled" program assures green coffee purchasers that what they are buying is 100% Kona and meets grading standards. 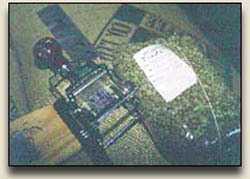 Currently no authenticity program exists for roasted Kona coffee so it is still buyer beware. While the true taste and aroma of Kona coffee are unmistakable it's still the best policy to know personally who you are buying your Kona coffee from. Don't be afraid to ask questions... the Kona coffee industry is comprised mostly of small family run operations who are eager to give advice and cater to your every need. It is a pride filled industry!